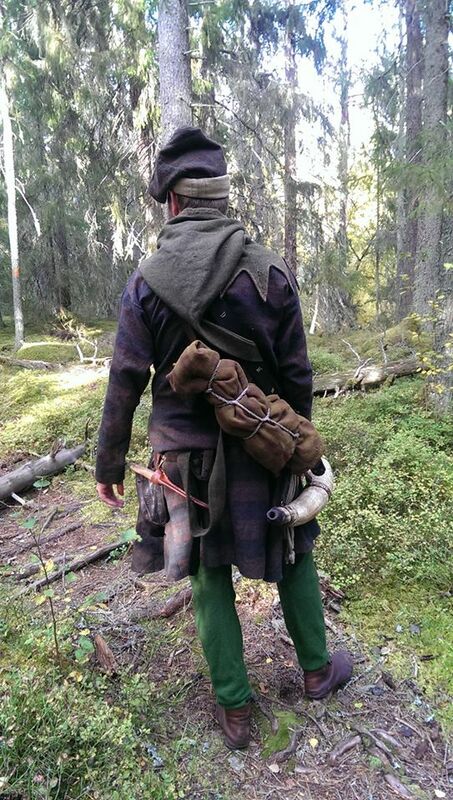 Many of our readers are out and about in the woods themselves in your medieval gear. We all face the same problem eventually. How do I get all my my stuff with me? I have said it before and I say it again. The medieval man was not the nature loving trekker we want her to be. You went into the wilds only when you had to. Even in Sweden, then a civilisation backwater, you had inns instated at least one day from each other. This was regulated by law. If this was not for some reason possible the villages where not that far-spread and you can often see one church from one parish to the other. The hunt was probably mostly over the day, judging from the huntbook descriptions. Starting in the morning and finishing in the evening when you where back home, or possibly in a hunting lodge if it was a far removed hunting area. Most described hunts are from dawn to evening, when you return to your home. The woods where also home to trolls and werewolfs. Even if we scoff at these notions today, they where real fears for medieval man. This means that they did not have the same need to lug a lot of gear around, and when they did it was often A LOT of it (meaning a sumpterhorse was needed). The reason I am addressing this is that many are translating their modern needs to a medieval environment. this usually means they want, or need, a rucksack or similar to carry their things in. This need was not as great for medieval man as her needs to carry a lot of stuff was not as big. Sleeping outdoors probably was very rare, and something that was avoided as much as possible. It is not unheard of though, but when its mentioned, for example in Decamerone, they just lay down on the ground. 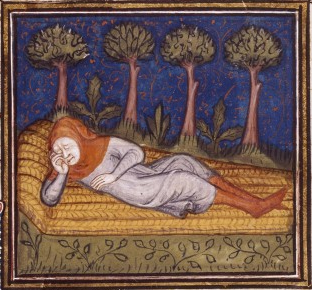 Henri de Ferriers is shown laying on some kind of straw-mat, but we don’t know if he is sleeping out or just resting. So, the backpack, what about that? We can start by saying that a backpack is virtually unseen unless you are using it in work. For example people picking grapes use a wicker basket on their backs for the grapes. Quarry-workers also have similar, or people having a need to transport things on a workplace. These wicker-baskets are mostly seen when you are transporting different wares or when harvesting. 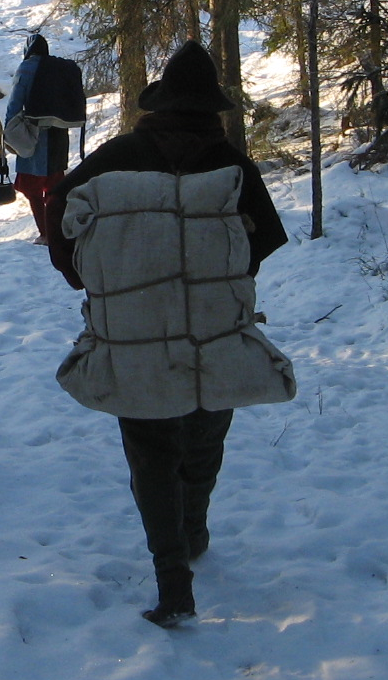 Also, some do not use two straps, but one horisontal, carrying the bag with the chest more then the shoulders. Of course these COULD have been used to carry things further. For example if you have to carry things out into the wild, it is possible even if we have not seen this on pictures, and If there are these baskets around, you would use it. They seem to be a popular way to transport goods. 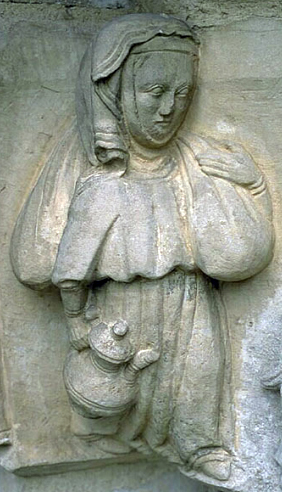 On the church of Martebo on Gotland, Sweden, we see a woman carrying things as she is wandering. She probably utilises a double sack, one that has two compartments and an opening in the middle. 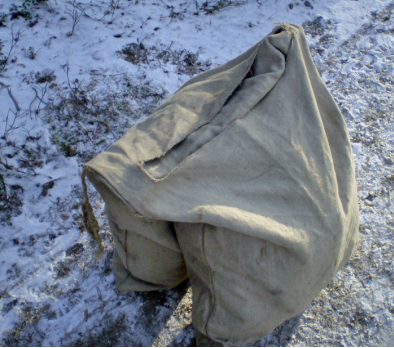 It is possible, although not likely, that it is a regular sack-, but the lack of a visible closing makes the first option more probable. This sort of bag appears to be both rather simple and common as it is seen in many other places too. It can be carried over the shoulder or used for sumpterhorses. I have been using this kind of bag for several years and it is quite possible to walk long distances with it loaded with the necessities needed. You might need to change shoulders now and then to distribute the burden. 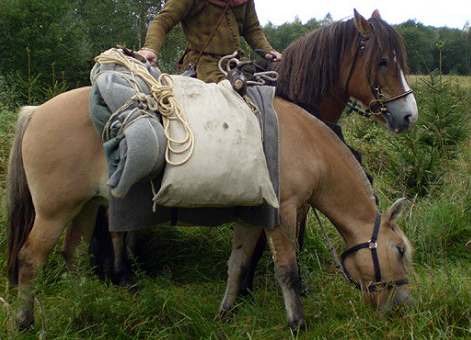 It is not as comfortable as a backpack, but its working and it is also easy to use with a horse. Of course, having a horse in medieval times is like having a car now. Most that actually where travelling around had a horse and they came as expensive as sin for a combat-trained stallion, destrier, or rather cheap for the lowest quality nag, one step away from the glue factory (or the dinner table if this was vikingtimes). Using a horse is a great way to get your stuff moved about, if you like to see the use of sumpterhorses I recommend this video of a medieval pilgrimage I did, where sumpterhorses was put to good use. 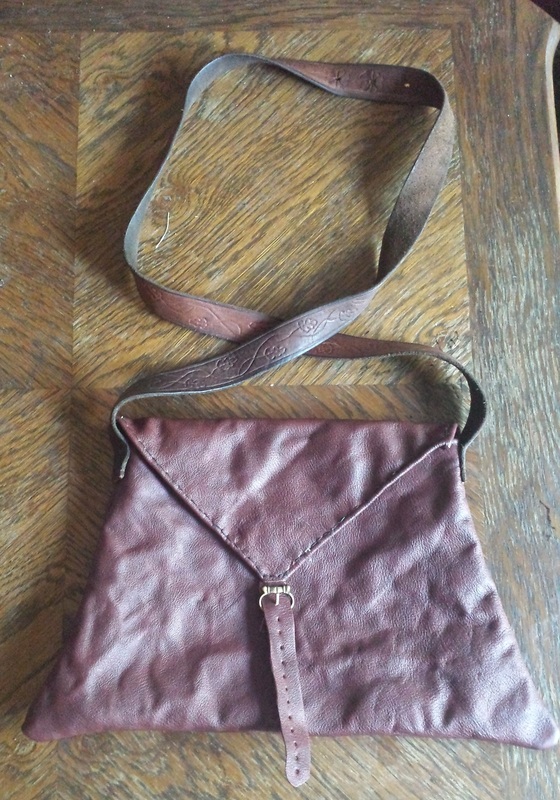 Shoulderbags are mostly seen on pilgrims. They are so much associated with pilgrims that they are a part of what identifies a pilgrim (the bag, and staff are often used as symbols for pilgrims). Pilgrims are of course the very example of medieval people that are travelling. But they are also in a way very non-representative for medieval travellers. Being a pilgrim means that you are supposed to rely on God and the kindness of others to get along. So all you needed was your bowl, spoon and a canteen of water. 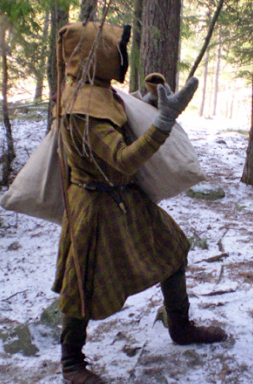 So, did others use shoulderbags, the ones we also call pilgrimbags? There is scarce evidence of anyone else then pilgrims using them. Why this is is hard to know. Perhaps the need was not big as they did not have a lot of things with them. But we can almost be assured that they had something to eat on long walks. Perhaps some coldcuts to nibble on between the inns. But we don’t know in what they carried this. I can not in good conscious say that shoulderbags was in good use by all, but to me it seems plausible if you had things you needed to bring. There is also a ongoing discussion (I can say this knowing that even if this article is read in two or three years from now, it will still be discussed…) if these bags are in leather or textile. If they are lined or not. No preserved pilgrimbags are known and in pictures they come in different colours. This can mean that it is textile, or that is dyed leather. I for one Think that they where common enough to probably have been made in both textile and leather. Lining of the bags is not easy to know. There are other bags and pouches that have linings, and using textile inserts in beltbags is not uncommon. Again, we do not know and both having and not having a lining seems plausible. You can also just fold everything into your blanket and tie it up nice and tight. 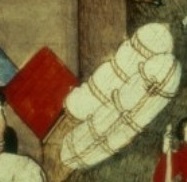 This is sometimes seen when medieval man is packing up trade items. I guess there is nothing really stopping you from doing the same with your personal stuff. So, we probably have more needs then medieval man had when we are out. Sleeping outdoors is something we can quite enjoy when it was something to avoid for them. If they had to they mostly probably just slept under a tree with the cloak for blanket. 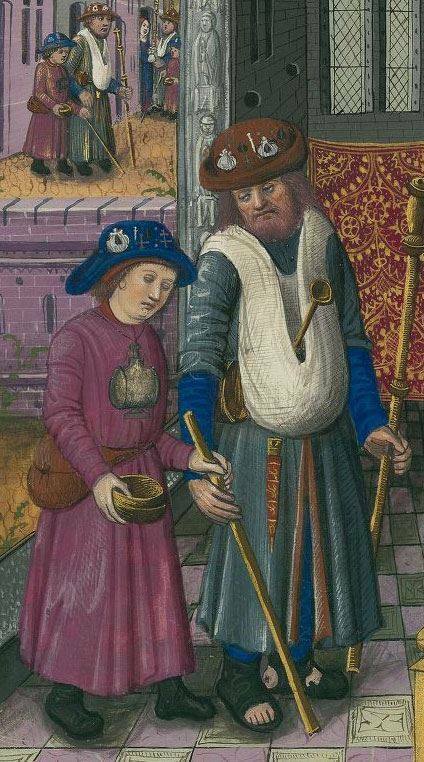 But hopefully you have gotten some ideas about how to lug around your gear in a probable medieval way. 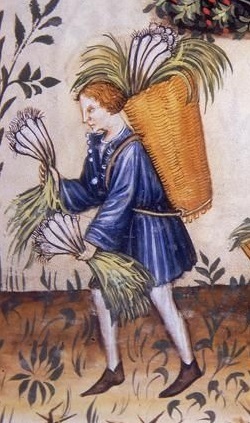 I myself mostly use the double carry sack (Martebo sack) when I need a full overnight kit, as these seems to be the most common pack of people travelling in the 14:th century. I have been walking days with it and it is not that uncomfortable, once you get used to it. For dayoutings a pilgrimbag is all that is needed. Sometimes I tie an extra cotte to the bagstrap if I think it might be needed. All I carry then is some cheese and wine and maybe a sausage for lunch. And a little bowl if I feel abit fancy.